Do you remember when I used to post about home decor? I haven’t done that in ages so I understand if you don’t. I’ve been so focused with food lately (because hello, food is awesome) that I’ve completely ignored my love of styling my home. I was inspired by my Gin And Tonic post from the other day to show you how I’ve designed a bar area in my dining room. Show the favorite liquors that have pretty bottles (it’s styling so of course it has to be pretty). Coordinate the liquor with the accompanying glassware. Knick knacks add flavor to any drink. My grandmother gave us the decanter and matching glasses. Ah, my favorite part of the bar! 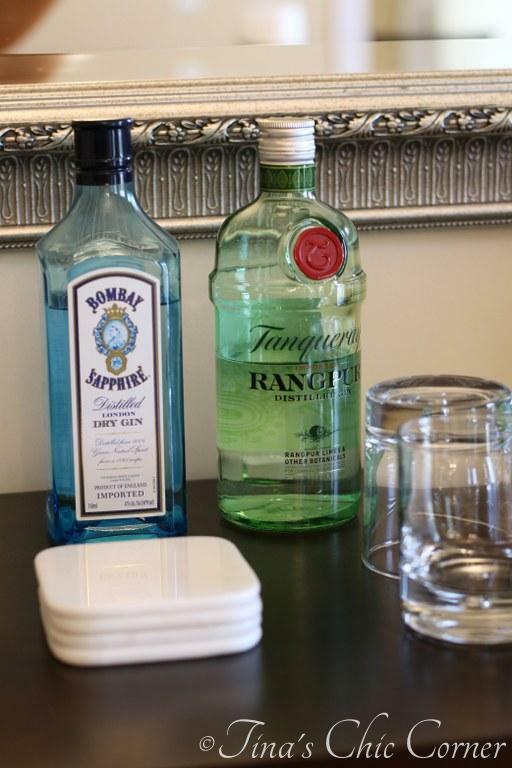 I keep the Tanqueray bottle in the fridge since that’s my go-to liquor and keeping it cold helps slow down how quickly the drink gets watered down by melting ice. These Lenox Goblets are part of a set (along with the matching beverage glasses) and were a wedding gift from my grandmother. I will treasure them forever. You can style a bar area on any budget. Have fun with it but don’t actually put your knick knacks into anyone’s drink. I love this! We’ve been wanting to get some kind of table to put our bar stuff on … I haven’t found anything right just yet but I’m coming back to this when I do! Very cool! We are working on decorating our new house right now… love it. So much fun! What a beautiful idea. I’ve always wanted some old style cut glass crystal, something about it that makes a bar bling up just right. Think it’s time to dust off my old wine bar cabinet.